The Moto G6 series is just seven months old but that isn’t stopping Lenovo from preparing its next-generation devices. 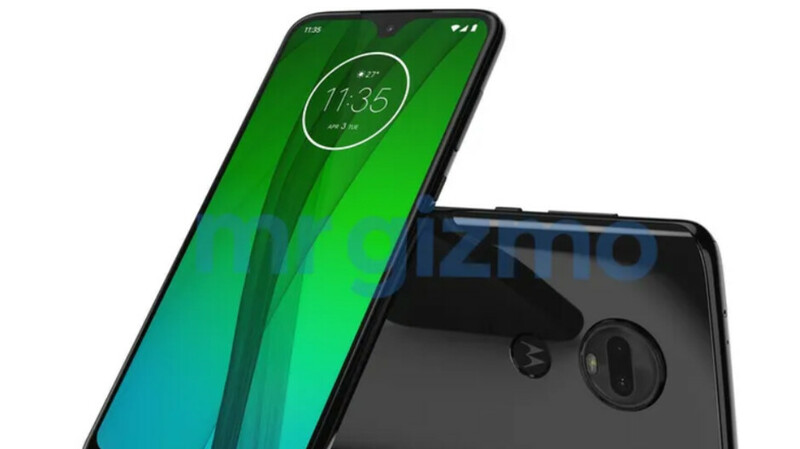 And just over a month after a bunch of CAD-based renders revealed the Moto G7’s design, today an official press render has leaked out confirming the updated look. Just like the Moto G6, the Moto G7’s body is carved out of both glass and aluminum. However, the more traditional 18:9 display has been replaced by a much taller panel that adopts a small, waterdrop-like notch. This is paired with slim side bezels and a significantly smaller chin that no longer includes a fingerprint scanner. Instead, Motorola has embedded the security feature within the rear logo. Speaking of which, this sits below the brand’s trademark camera module that once again includes two rear cameras and a dual-LED flash. Moving on to the smartphone’s frame, a speaker grill, USB Type-C port, and 3.5mm headphone jack can all be found towards the bottom. This is combined with a couple of microphones on top, and a volume rocker and power key on the right side. In regards to internals, a leak from earlier today revealed that Qualcomm’s Snapdragon 660 would be present on the inside. This is set to be paired with 4GB of RAM and a respectable 64GB of internal storage. These specs will then be paired with a 3,000mAh battery, just like the current model, and hopefully Android 9 Pie. Lastly, when it comes to availability, the Moto G7 will make its official appearance in early 2019. Possibly at MWC 2019 in February. When this happens, the regular model will likely be accompanied by a Moto G7 Play, Moto G7 Power, and Moto G7 Plus. I still prefer bezels over notches. Then somebody who is anti-bezel will say "I still prefer notches over bezels". True story. Same boring designs. Get rid of that chin already, you lame manufacturers ! It's not as easy as you might think. The chin houses the display connector. To get rid of the chin, manufacturers have to bend the display under the glass, which is very costly (Apple also has a patent for this). This is also impossible to do on LCDs because they aren't flexible like OLEDs. Since the G6 family has LCDs, it's unlikely that Motorola will implement an OLED screen for the G7. If you're wondering about the XR, that still has a chin. Moto G7 has a stylish look even with a chin at the bottom. Wish Moto went with snapdragon 675 instead of 660.